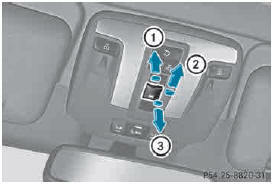 ► Turn the SmartKey to position 1 or 2 in the ignition. switch briefly beyond the point of resistance in the direction of arrow 2. The sliding sunroof opens completely. ► To interrupt automatic operation: press or pull the switch again. When opening and raising the roof, automatic operation is only available if the sliding sunroof is in the closed position.